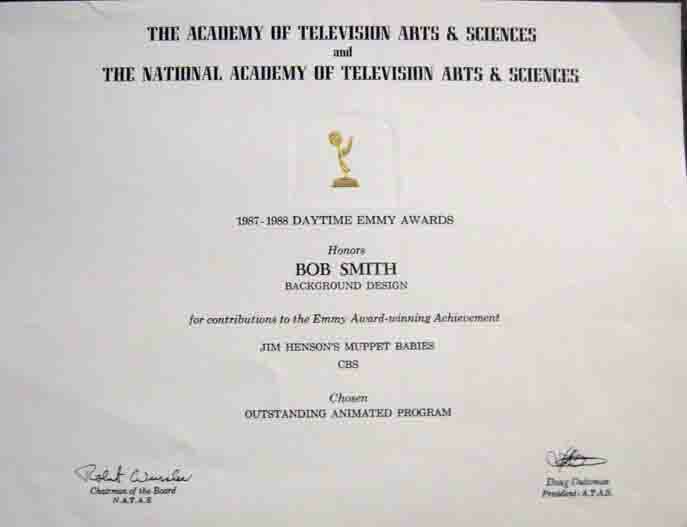 ‘Babies’ received four Emmy Awards from 1984-1988. Bob drew the background for most of these shows. The background provides the mood, location and atmosphere, i.e. scary, cheerful, etc. His drawings were amazing and his hearty sense of humor well reflected. The words of the script need voice and character but the background completes the effect. 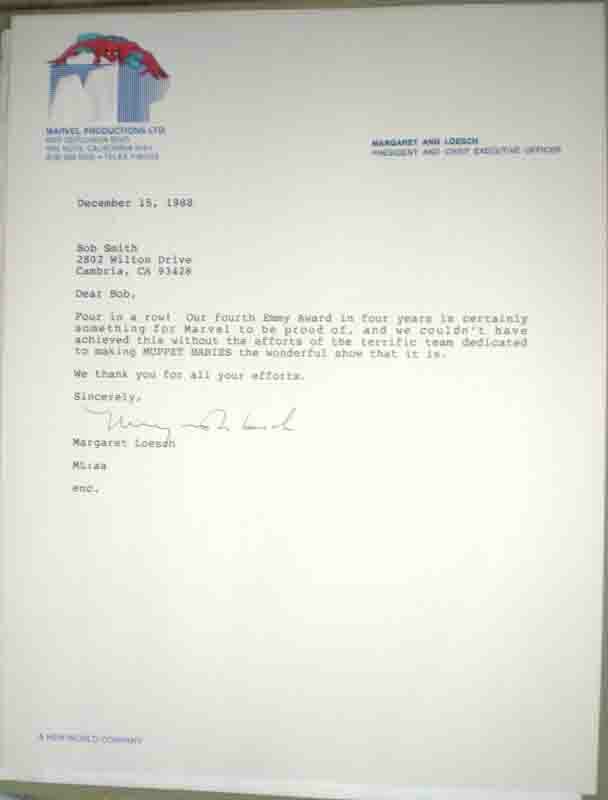 The deadlines were tough. Their script arrived Monday morning and they met to develop the storyboards. At the meeting they divided the job. All finished drawings and voice-over’s had to be done, camera ready and sent to New York by noon each Friday for the Saturday morning show. The stories were honest, heartwarming, and funny and always contained a good life’s lesson. Each installment ended with a wonderful moral to the story; no matter what your age, you’d enjoy it. Bob truly enjoyed working with this great cast, crew and studio. Jim Henson was the creator of Muppets. You don’t often hear the words ‘genuine gentleman’ in this industry, but you did when Jim Henson was mentioned; he was genuine and a gentleman. Bob Richardson was the Producer, a good, talented man. The entire collection of talent made for an award-winning recipe. They had one show that was a takeoff of the then popular Star Wars series. It parodied the ‘Death Star’ where Darth Vader resided. Bob’s concept was the ‘Death Tomato’. To understand the connection, you’d have to recall a leading character named Fozzie, a teddy bear with a vaudevillian line “wacka, wacka, wacka”. In Vaudeville they threw tomatoes at the stage performers the audience didn’t like. The series was all good fun with smart underlying themes. Many people have never actually seen an Emmy Award; we’ve included a photo of one along with a letter from the head of Marvel Productions, Margaret Loesch for a glimpse of history.